With the grace of my Sadgurudeva and by his order, I was exulting in a special Sadhana to achieve certain ‘Gupt Kaal Khand Gyan’ and mystery of astrology. Along with this, he put me in a condition that I have to complete it while living in material world. It was really difficult because when you are doing Sadhana and concentrating at one side and at the same time you are doing certain tasks that are exactly reverse, it becomes a big trouble. However, I always stayed blessed with the boon giving hand of Sadgurudeva over my head. Well, all these things are different, but amongst all these mysteries of astrology I got to know about one with the help of Gurudeva’s boon. Here, I am going to publicize it. Trust me, if you assimilated this mystery, you will never get troubled of anything throughout the life neither you will have to do any other Sadhana. Hence, the overall summary of all the mysteries is this. Let’s know how. Everybody on this Earth needs a medium to survive or to fulfill desires. Either it is this material life or spiritual life, we need it anyhow. And, Mahalaxmi has the biggest contribution in fetching all this, why? It is because Maa doesn’t have any one form, rather she has 1008, 108 and least 8, to whom we also know as ‘Ashtalakshmi’. She is for progeny, wealth, health, age and many other allied aspects. So, it means that if Goddess is entirely happy with me then I will get her ultimate blessings from all her incarnations. But, does it really happen? Yes, but there are very few Sadhak who get blessed from all her incarnations. If everybody would have got blessed by her then Steve Jobs wouldn’t have died with Cancer. He was also not blessed. Is there no way of finding Maha Lakshmi? If yes, then where is it? And, the answer was hidden in that ‘Kaal Khand’ of Astrology seeing which I got amazed. Though nature has spilled itself in thousands of forms, ten of them are supreme lore. Amongst all these ten super sciences, the tenth one is Maa Kamala. We also call her Mahalaxmi and Ashtalaxmi is the divided form of Mahalakshmi. If you look at the Kundali of Kaal Purush, tenth house from ascendant will be Capricorn, how? We have talked about here of Kaal Purush birth chart, then it is obvious that first house will be Aries and 10th house from Aries will naturally be Capricorn, which signifies profession and career because it is a work house. Now, who is the Lord of tenth house or you may say the Lord of Capricorn sign? Yes, you have guessed right, Lord Saturn, God of work. Think, position of Maa Kamala is tenth and Saturn is also the Lord of tenth house. That is why it is said that Lakshmi resides with only virile. 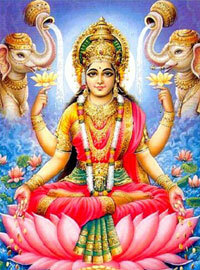 You all have must have heard the adage that Lakshmi looks good coming and Saturn going. It is exactly correct because Lakshmi represents ‘Shukla Paksha’ whereas Saturn represents ‘Krishna Paksha’. And you see, the night of Diwali also falls in Krishna Paksha, which signifies the completion of Krishna Paksha. It means the departure of Lord Saturn and Shukla Paksha begins from the next day, which signifies the arrival of Goddess Laxmi and ends in the full moon night of Kartika. Therefore, it means that if you wish to get blessings from Maa Lakshmi, you need to worship Lord Saturn first because he is a kind of ‘Bhairav’ to Maa Lakshmi. Because, he is the Lord of tenth house as well as work, and Goddess only resides at the place of virile as we all know. As he is also the Lord of work, so undoubtedly he is also the boss of our previous birth’s deeds and perversions. That means if you worship him, you will get rid of all your perversions made in this birth as well as past births. Poverty is also a perversion, which is also a result of a bad deed. Till poverty doesn’t vanish, Goddess Lakshmi won’t arrive. That is why first Krishna Paksha and then Shukla Paksha. This means that first worship the Lord of deeds Saturn and then Goddess Lakshmi because both Saturn and Laxmi are the two sides of a single coin. So, this Diwali, you should worship Lord Saturn because arrival of Goddess is impossible without the removal of perversions. I am not saying this, it is said by astrology. On the base of tenth house, it says that if you want bread, cloth and shelter then you should worship Lord of work Saturn and then worship Goddess Kamala. With these words, I would like to wrap up. Is same theroy can use to encode other mahavidya's with astrology? that mean other aspect of life and Sadhana and astrology? Will 2013 Stop the Series of Death in Bollywood?